On Tuesday, 17 July the 100th anniversary of the Republic of Estonia will be celebrated in Finland at the Pori Jazz Festival with the concerts of three Estonian jazz groups – Kadri Voorand in Duo with Mihkel Mälgand, Joel Remmel Trio and Erki Pärnoja : Efterglow. The largest jazz festival in Finland, Pori Jazz 2018 will be held from 14 to 22 July. The nine days of the festival are filled with performances of the world’s best jazz, soul and funk artists. On Tuesday, 17 July from 5 pm to 9 pm, three Estonian jazz groups will perform on the Lokkilava festival stage: Kadri Voorand in Duo with Mihkel Mälgand, Joel Remmel Trio and Erki Pärnoja : Efterglow. In parallel with the jazz festival, SuomiAreena public debate forum will be held in Pori as part of the Estonia 100 programme, this time focusing on Estonia. Kadri Voorand is an internationally renowned Estonian vocalist and composer. Mihkel Mälgand is one of the musically most active double bass players in Estonia. The duo mainly performs original music for vocal, piano and bass, where there is space for both improvisation and airy electronic effects. Lyrics of the songs are either texts by Estonian poets or original creations. Having enriched the Estonian jazz life for almost ten years already, pianist Joel Remmel has been leading the Joel Remmel Trio for more than seven years. The sound of the group has considerably changed during these years. While their first album, Lumekristall (2012) was heavily influenced by Scandinavian jazz, their third album, Some Things Never Change (2016) features more traditional sounds. 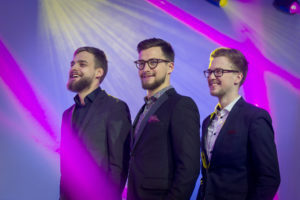 Other members of the trio belong among the most dazzling younger generation jazz musicians in Estonia – Heikko Remmel on double bass and Ramuel Tafenau on drums. Estonian songwriter and multi-instrumentalist Erki Pärnoja will perform at Pori Jazz with his band Erki Pärnoja : Efterglow. Their calm, acoustic and mystical-sounding music combines ethereal synthesizer sounds with scratching and melancholic guitar. The aim of “Jazz Present to Europe”, the joint project of Estonian Jazz Union and Jazzkaar, is to introduce Estonian jazz music and musicians at prestigious European festivals. In the year of the centennial of the Republic of Estonia, “Jazz Present to Europe” has already introduced Estonian jazz in Belgium, England, Germany and Finland. At the end of the year Estonian jazz musicians are invited to perform again at London Jazz Festival. We would like to thank the supporters of the “Jazz Present to Europe” project – Estonia 100, Estonian Tourist Board at Enterprise Estonia and Embassy of Estonia in Finland. The project is carried out in cooperation with Pori Jazz Festival on the initiative of Estonian Jazz Union and Jazzkaar.